Plural word of unknown derivation used in the Old Testament to denote the primitive Semitic house-gods whose cult had been handed down to historical times from the earlier period of nomadic wanderings. The translation of the term "teraphim" by the Greek versions, as well as its use in the Scriptures, gives an excellent idea of the nature of these symbols. Thus Aquila renders the word by "figures"; the Septuagint in Genesis by "images," in Ezekiel by "carved images," in Zechariah by "oracles," and in Hosea by "manifest objects" (δῆλοι). The Authorized Version often simply transcribes the word, as in Judges xvii. 5, xviii. 14 et seq., and Hos. iii. 4, but frequently translates it "images," as in Gen. xxxi. 19 et passim. The rendering "images" occurs in I Sam. xix. 13 also, "idols" in Zech. x. 2, and "idolatry" in I Sam. xv. 23. The form of the word in Hebrew must be regarded as a plural of excellence. Just as "Elohim" denotes "gods" and "God," the form "teraphim" is applicable to each single object as well as to the entire class (comp. I Sam. xix. 13 and Gen. xxxi. 19). That teraphim were really images of human shape and of considerable size is plainly seen from I Sam. xix. 13, where Michal, the daughter of Saul, places one in David's bed in order to conceal his escape from her enraged father. It is furthermore evident that they were not too large to be easily portable, inasmuch as Gen. xxxi. 19 mentions that Rachel, without her husband's knowledge, stole the teraphim which belonged to her father, Laban, and, when she wished to conceal them, placed them among the camel's furniture and sat upon them (Gen. xxxi. 34). The nature of the teraphim cult and its gradual decay seem also perfectly clear. It may be noted that teraphim were regarded in early times as representatives of real gods endowed with divine attributes (comp. Gen. xxxi. 30, where Laban, rebu-king Jacob for Rachel's theft of the teraphim, asks, "Wherefore hast thou stolen my gods? "), and that evidently the teraphim cult was practically on a plane with Yhwh worship. In Judges xvii. 5 Micah has "an house of gods" ( ) with a duly appointed priest; he makes an ephod (see below) and teraphim, which were used together with "a graven image" and "a molten image" made from silver dedicated to Yhwh; the figures were evidently Yhwh images. The value of the teraphim to the family and the tribe is shown by the statements that Rachel stole them from her father (Gen. xxxi. 19), and that the Danites, when they went to spy out the land of Laish, took away by force from the house of Micah not only the Yhwh images just mentioned, but also the ephod, the teraphim, and the Levitical priest (see Judges xviii.). In early times teraphim-worship was undoubtedly tolerated by the Yhwh religion, as may be seen, for example, from I Sam. xix. 13 (the story of Michal, the daughter of Saul), where it is tacitly implied that a teraphim was a usual piece of furniture in the household of a loyal follower of Yhwh. In Hos. iii. 4 and in Gen. xxxi. 19, also, teraphim are alluded to without comment, although Prof. H. P. Smith ("Samuel," p. xxxiv.) thinks he detects a touch of sarcasm in the latter passage. It is certain, however, that teraphim soon became an object of distinct condemnation in the Yhwh cult. In Gen. xxxv. 2 et seq. Jacob orders that the "strange gods" ( ), by which teraphim images were probably meant, be put away by his household and buried. The spot which was thus defiled was made a holy place by Joshua (Josh. xxiv. 20-26). Furthermore, in I Sam. xv. 23 Samuel in his rebuke to Saul is made to classify teraphim with iniquity ( ) and rebellion ( ). Josiah, the reforming king, did away with the magicians and wizards as well as with the teraphim and idols ( ), all of which are grouped together as "abominations" (II Kings xxiii. 24). With these passages should also be compared Zech. x. 2 (R. V.): "for the teraphim have spoken vanity, and the diviners have seen a lie; and they have told false dreams." It will appear from the above quotations that the most important function of the teraphim, at any rate after the spread of the Yhwh cult over Israel, was that of divination. Evidently the images were used chiefly for oracular purposes, although nothing is known of the method of their consultation; it is probable, however, that they were used in connection with casting the sacred lot (comp. Zech. x. 2; Ezek. xxi. 26 [A. V. 21]). The mention of an ephod in connection with teraphim (Judges xvii. 5, xviii. 20) is a peculiar use of that word, which in these passages represents merely "a portable object employed or manipulated by the priest in consultation with the oracle" (comp. Moore, "Judges," p. 379, and see Judges viii. 27, which clearly describes an ephod as an object employed in divination). This use of the word seems to be quite distinct from that in the so-called P document (Ex. xxviii. 6 et seq. ), where a high-priestly garment of the same name is referred to (see Ephod). Such oracles were probably consulted down to a quite late date (comp. Hos. iii. 4, Hebr. : "for the children of Israel shall abide many days without a king, and without a prince, and without a sacrifice [ ], and without a pillar [ ], and without an ephod, and without teraphim"). The passage II Kings xxiii. 24, cited above, makes it evident that teraphim had survived in later Judah. The mention of teraphim in Zech. x. 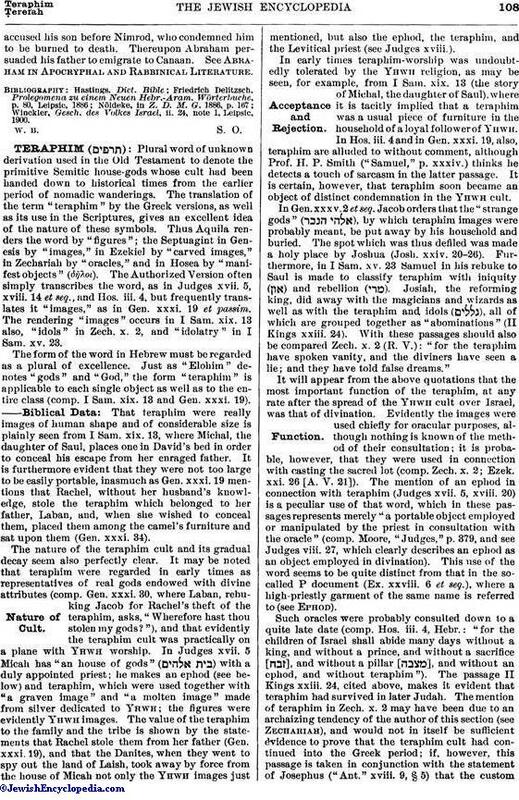 2 may have been due to an archaizing tendency of the author of this section (see Zechariah), and would not in itself be sufficient evidence to prove that the teraphim cult had continued into the Greek period; if, however, this passage is taken in conjunction with the statement of Josephus ("Ant." xviii. 9, § 5) that the customof carrying house-gods on journeys into strange countries prevailed in his time in the Mesopotamian regions, it appears highly likely that the use of teraphim continued into the first Christian century and possibly even later. It would seem, then, as remarked above, that teraphim, like the Roman Lares and Penates, originally represented house-gods, which were carried about by the primitive Semitic nomads as fetishes along with their family effects, and that these deities were in all probability worshiped at first as the most important divine objects known to the followers of this cult. Although nothing whatever is known about the origin of the teraphim cult, it may have been a survival of primitive ancestor worship; i.e., the images may have originally represented the deified ancestors of the family which revered them, and may have become later a sort of Manes oracle. They were probably not astral personifications. The cult could not have been regarded as indigenous among the Israelites, because the deities are characterized as "gods of the stranger" (A. V. "strange gods") in Gen. xxxv. 4. In Ezek. xxi. 26 (A. V. 21) it is recorded that the King of Babylon consulted teraphim, and "looked in the liver"; i.e., he made use of magical incantations as well as of the astrological rites common in Babylonia. It is not at all unlikely that the Israelites obtained the teraphim cult from their Aramean kinsmen. 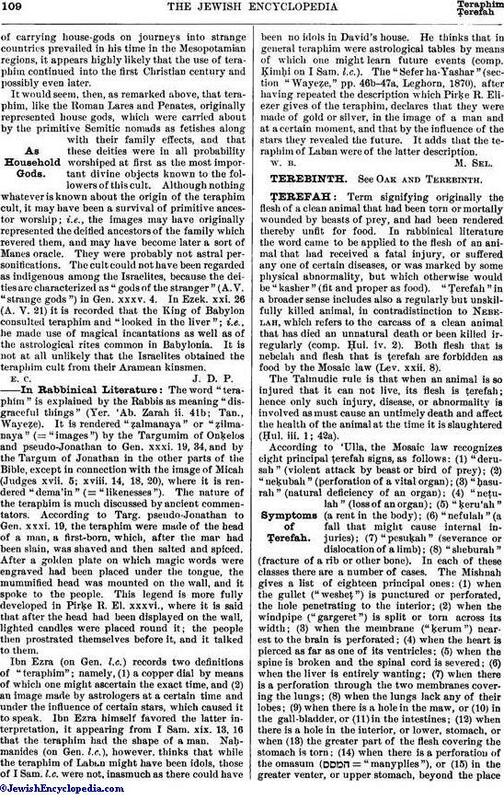 The word "teraphim" is explained by the Rabbis as meaning "disgraceful things" (Yer. 'Ab. Zarah ii. 41b; Tan., Wayeẓe). It is rendered "ẓalmanaya" or "ẓilmanaya" (= "images") by the Targumim of Onḳelos and pseudo-Jonathan to Gen. xxxi. 19, 34, and by the Targum of Jonathan in the other parts of the Bible, except in connection with the image of Micah (Judges xvii. 5; xviii. 14, 18, 20), where it is rendered "dema'in" (= "likenesses"). The nature of the teraphim is much discussed by ancient commentators. According to Targ. pseudo-Jonathan to Gen. xxxi. 19, the teraphim were made of the head of a man, a first-born, which, after the man had been slain, was shaved and then salted and spiced. After a golden plate on which magic words were engraved had been placed under the tongue, the mummified head was mounted on the wall, and it spoke to the people. This legend is more fully developed in Pirḳe R. El. xxxvi., where it is said that after the head had been displayed on the wall, lighted candles were placed round it; the people then prostrated themselves before it, and it talked to them. Ibn Ezra (on Gen. l.c.) records two definitions of "teraphim"; namely, (1) a copper dial by means of which one might ascertain the exact time, and (2) an image made by astrologers at a certain time and under the influence of certain stars, which caused it to speak. Ibn Ezra himself favored the latter interpretation, it appearing from I Sam. xix. 13, 16 that the teraphim had the shape of a man. Naḥmanides (on Gen. l.c. ), however, thinks that while the teraphim of Laban might have been idols, those of I Sam. l.c. were not, inasmuch as there could have been no idols in David's house. He thinks that in general teraphim were astrological tables by means of which one might learn future events (comp. Ḳimḥi on I Sam. l.c.). The "Sefer ha-Yashar" (section "Wayeẓe," pp. 46b-47a, Leghorn, 1870), after having repeated the description which Pirḳe R. Eliezer gives of the teraphim, declares that they were made of gold or silver, in the image of a man and at a certain moment, and that by the influence of the stars they revealed the future. It adds that the teraphim of Laban were of the latter description.